Check out our review of Eastern Twist that we did for Halal Foodie. “Eastern Twist offers unique and flavourful fusion fast food. The food is fresh, tasty and a little adventurous. 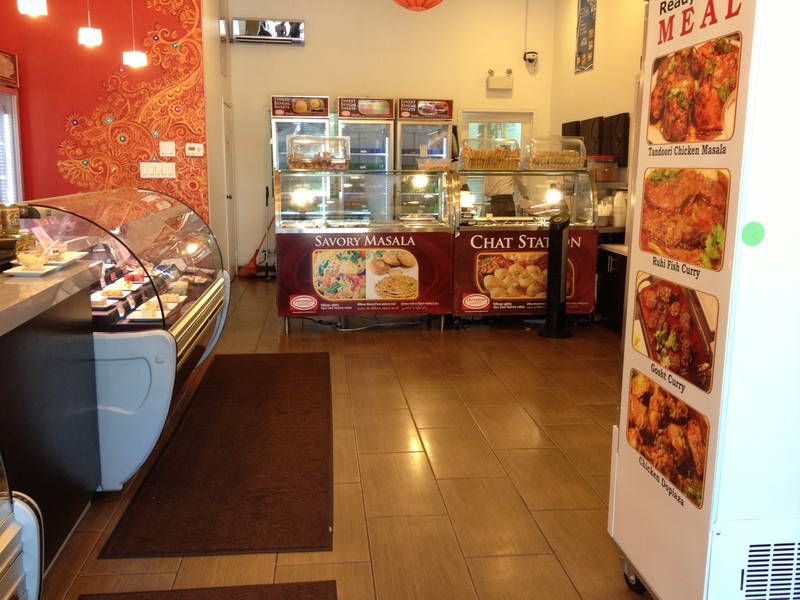 We enjoyed the butter chicken wrap and highly recommend it”. Categories: Restaurant Reviews | Tags: Butter Chicken Wrap, Eastern Twist, Fusion Food, GTA, Halal, Halal Food, Halal Food Review, Halal food toronto, Halal fusion food, Halal Restaurant, Toronto | Permalink. We love peanut butter and what better way to enjoy it than to incorporate it in cookies, to satisfy our sweet tooth. 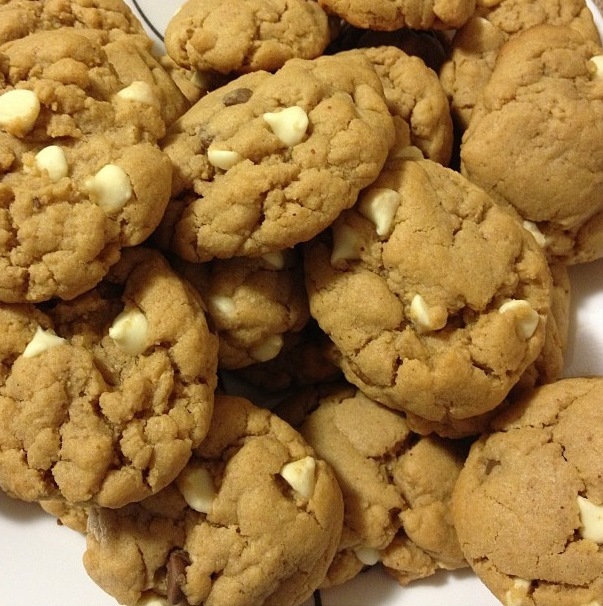 By the way, we only had a handful of chocolate chips and we love white chocolate chips, so we added white chocolate chips to the recipe to make up for the shortage of chocolate chips. Categories: Recipes | Tags: butter, chocolate, chocolate chip, cookies, dessert, Halal, Homemade, kitchen aid, kitchen aid mixer, peanut, peanut butter, recipe, white chocolate, white chocolate chip | Permalink. We are fond of trying new restaurants and enjoy Italian food. Not too long ago we were craving Italian food and it was fairly late in the evening. We were hungry enough to feel satiated, but not go overboard. So we decided to try Sapore Halal Italian Eatery. This happened on a weekday night, so the restaurant wasn’t bustling, which we didn’t mind. 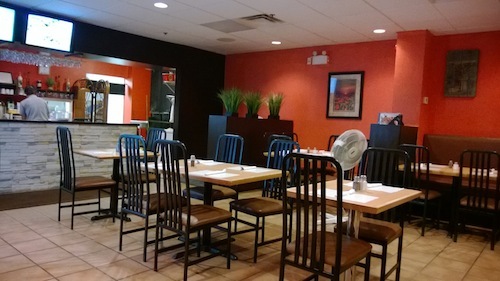 Our first impression was good, as we found the restaurant to be nice and clean with decent ambiance. 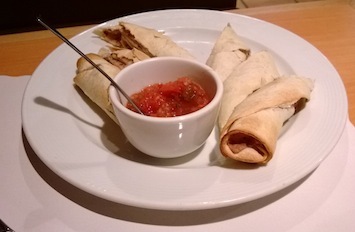 Since we weren’t too hungry, we decided to share Antijitos for appetizer and ordered 8oz Steak with Peppercorn Sauce. Since this was our first time here, we decided to play somewhat safe by ordering dishes we knew we’d enjoy. Antijitos were delicious; the beans and jalapeño peppers weren’t overpowering at all. The cream cheese of course made the experience all that enjoyable. Whenever we return, we’d love to order Antijitos again. Our Steak in Peppercorn Sauce was delicious too. 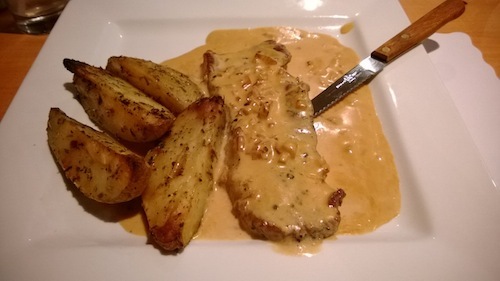 If you know what Peppercorn Sauce tastes like and enjoy it, you won’t be disappointed. The Peppercorn Sauce was slightly on the sweeter side, which was fine. You wouldn’t wanna go to two different restaurants and expect their Peppercorn Sauce to be exactly the same. The steak tasted fine as well. We prefer our steaks to be well done, which we forgot to mention. Hence, next time around we plan on indicating our preference for the steaks, so that we can enjoy it to a greater degree. Since we decided to share the appetizer and steak, we had room for dessert. 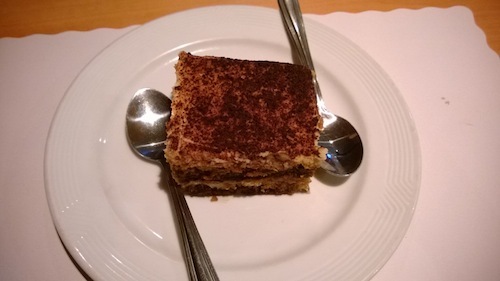 We ordered Tiramisu. Gotta say, it tasted good! It was very nice and moist and was served chilled. Overall, we enjoyed our meal. We enjoy trying different restaurants, especially when they can offer same or similar dishes, but with their own touch of uniqueness. There are a couple of other halal Italian restaurants that offer slightly better presentation, but it’s nothing we can complain about. Our food arrived in a timely fashion as well. Once our meal was served, no one came to our table to ask if we needed anything else. In our humble opinion, it would’ve been nice, especially since we had something on our mind, but we had to getup and ask. It would be nice if they drop by at least once to see everything’s ok and to remember to ask whether drinks and/or dessert is needed. Categories: Restaurant Reviews | Tags: antijitos, Halal, Halal Food, italian food, Mississauga, restaurant, Sapore, Sapore Halal Italian Eatery, steak | Permalink. So we’ve been on a dessert frenzy and have been trying a variety of recipes. After much Googling and researching, we came across the following recipe that resulted in two loaves of perfect tasting pound cake! A traditional pound cake has no leavening other than air and eggs. Our recipe, while egg rich, has some baking powder in it as well to lighten it a little. To lighten it even more, separate the eggs before you begin. After creaming the butter and adding the sugar, beat in just the egg yolks. Beat the whites separately until they form stiff peaks, and fold them in after all the other ingredients have been combined. When you cream butter, it may seem at the beginning as if you’re just mashing it flat. But if you persevere, you’ll begin to see it get “fluffy.” What you’re really doing is adding air. When you beat the butter with sugar, it becomes even fluffier, evidence of more air. And when the eggs are beaten in, the fluffiness is at its peak. That’s why this part of the mixing is so important. The more air bubbles you can beat in at this stage, the more air bubbles there are to expand in the heat of the oven. Baking powder or soda can do part of the work of leavening, but the more air bubbles you can get into a batter manually, the finer and lighter the texture of the finished cake. In a separate bowl, blend together the flour, baking powder and salt. Pour the milk into a third small bowl, mix the brandy and vanilla, or whatever flavoring you’re partial to. Alternately add the wet and dry ingredients to the butter/sugar/egg mixture. Pour into a lightly greased tube pan, or two 5 x 9-inch bread pans, and bake for about 1 hour or until the top surface of the cake springs back when you press on it gently with your fingers. Let the cake cool thoroughly after it is done, cover and store for a couple of days to allow the flavor to mature. A pound cake is usually sliced thin. We have enjoyed eating burgers from time to time, but that all changed with once fresh, non-frozen, halal gourmet burger joints started springing up across the GTA. We’ve tried and enjoyed a variety of gourmet burger restaurants and have never looked back to frozen, pre-processed burgers. Upon hearing about The Burgernator in Kensington Market, we were compelled to try it out. The Burgernator’s menu is quite extensive and is sure to please every palate. We decided to do a take-out due to time constraints and settled for: The Atomic Burger and The Big Bang, along with a side of fresh home cut fries. One bite into the burgers and you could tell, they really are non-frozen, freshly prepared beef burgers, that were further enhanced by super soft and top quality buns. The Big Bang: overall, it was a good burger and the addition to chicken wing certainly made it unique. The burger itself was mildly spiced. The garlic aioli that it came with certainly enhanced the taste. The Atomic Burger: it was full of flavour for sure. You can really taste the deep fried herb-crusted cheese and as you slowly work your way through, you can taste the beef patty as well. We relied on garlic aioli to balance out the taste of deep fried herb-crusted cheese and the remaining burger. We gotta admit that both the burgers were very unique and nothing of sort that we’ve tried before, so we enjoyed it. Given that we found the burgers to be mildly seasoned, we are looking forward to asking them to make our burgers a little more spicy and perhaps looking into other aioli (along with garlic aioli) to enhance the taste. Home Cut Fries: we found the home cut fries to be fairly standard. Garlic dip complimented the fries well for sure. Though we have ideas on what to request next upon our future visit to further enjoy our Burgernator burgers, we give it a thumbs up. You really gotta give’em a try to see experience the superb quality of ingredients! 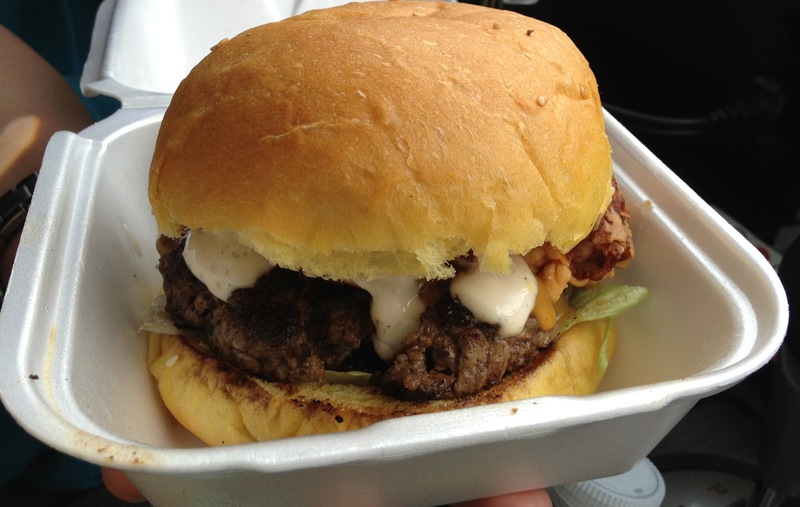 Categories: Restaurant Reviews | Tags: Burger, burgernator, gourmet, Halal, kensington market, the burgernator | Permalink. What’s one dessert that doesn’t make us feel too guilty about devouring it? Carrot Cake! At least we are getting some portion of our veggies! We’ve always enjoyed eating store bought carrot cakes. One day while looking to satiate our sweet tooth, we decided to try out one of the carrot cake recipes. Lo & behold it was a success, alhamdulillah! We shared it with kids, family and friends; thankfully it was equally well-received by everyone. The general feedback was it turned out very nice and moist and it tasted equivalent to a store bought carrot cake. In a large bowl, beat together eggs, oil, white sugar and 2 teaspoons vanilla. Mix in flour, baking soda, baking powder, salt and cinnamon. Stir in carrots. Pour into prepared pan. To Make Frosting: In a medium bowl, combine butter, cream cheese, confectioners’ sugar and 1 teaspoon vanilla. Beat until the mixture is smooth and creamy. Frost the cooled cake. We are die hard mithai fans and always looking for good mithai. We learnt about Premium Sweets, a Muslim owned Bangladeshi sweet shop, a while back, but didn’t try it until we were referred by a relative. Yesterday we decided to pay a visit to their Mississauga store. 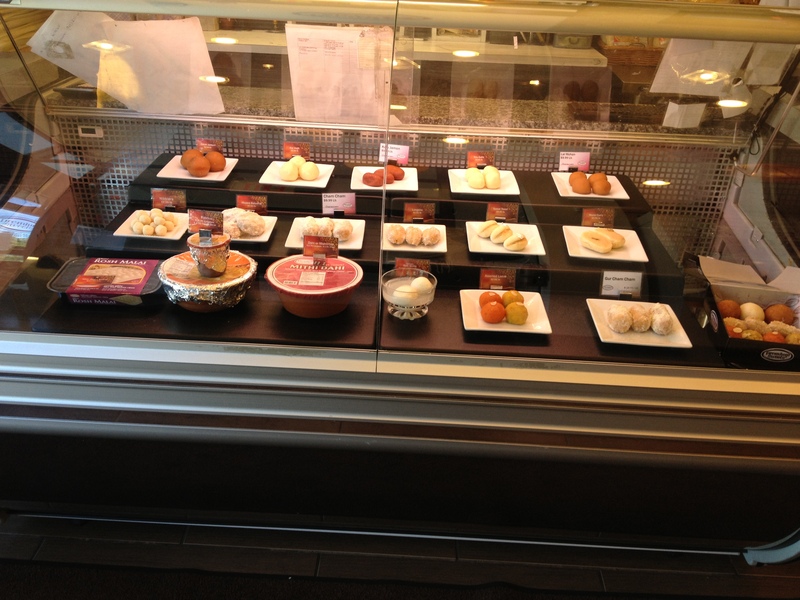 Let us say that their dessert store is amazing, in terms of ambiance, cleanliness, and presentation of sweets. We were highly impressed by their customer service as they were very professional and knew the products well. The server greeted us as we entered the shop and offered to help us familiarize with the sweets. Premium Sweets is also known to be very generous with offering samples. Since we weren’t too familiar with Bangladeshi sweets, we decided to sample a variety of sweets. 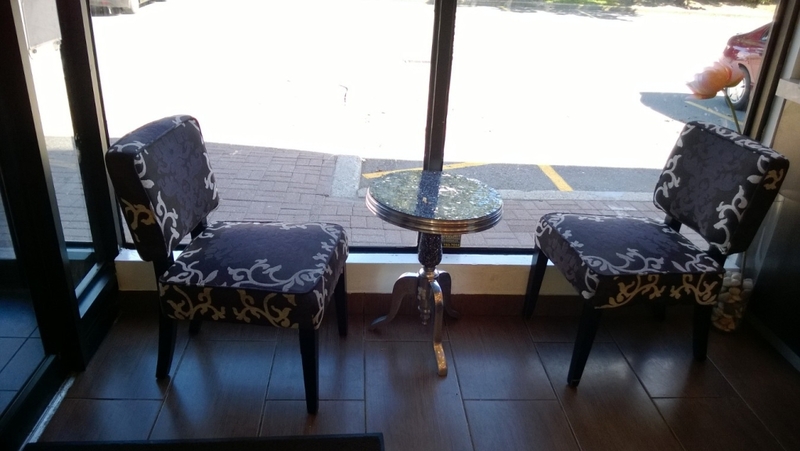 At their Mississauga location, they have a couple of chairs to sit down and try the samples. Everything tasted good. We did find similarities in names, shapes and tastes between Pakistani & Bangladeshi sweets. Our favourites were Lal Mohan (Pakistani equivalent of Gulab Jaman) and Chum Chum along with some Barfis. Some of their mithais had different names and tastes, but we’re sure their variety can satisfy everyone’s palate. We also tried their Ras Malai, Rabri, and Kheer Toast. At Mississauga location, they had all the mithai/sweets on diplay. Once you’re done deciding, they would take your order and prepare it in the back of the store. 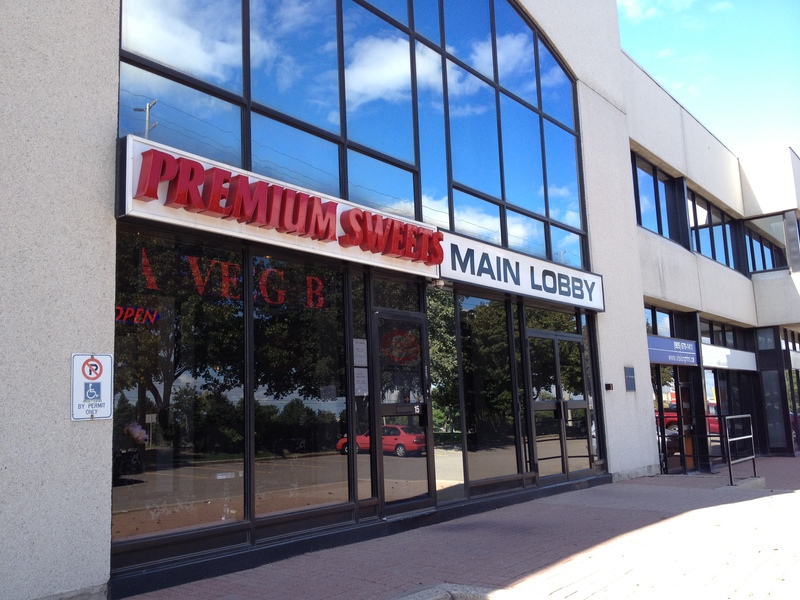 Premium Sweets call themselves the Godiva of South Asian Sweets. By trying their mithai, we can attest that you can taste the fine quality ingredients used in their mithai, especially given our own experience with being around South Asian sweets. They do have a wall with a large selection of wrapping papers and other items. If you’re in the area, we highly recommend paying them a visit. Categories: Restaurant Reviews | Tags: Bangladeshi Mithai, barfi, Bengali Mithai, borfi, Burfi, Cafe, chum chum, Desi Sweets, dessert, GTA, gulab jaman, Halal, Halal Dessert, Halal Food, Halal Food Review, Halal food toronto, Halal Mithai, Halal Restaurant, lal mohan, Mississauga, Mithai, Pakistani Mithai, Premium Sweets, Premium Sweets Toronto, Toronto | Permalink.